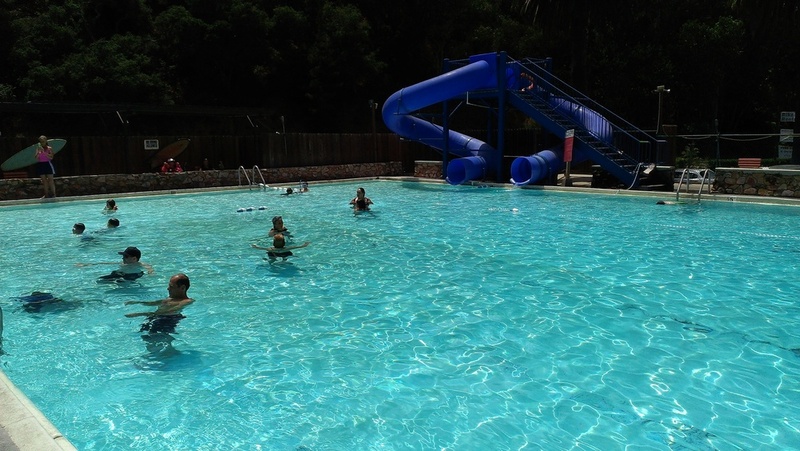 Our large outdoor fresh water heated pool with its sunny deck and great weather all year long is open to the public and is popular with our locals and visitors alike. It is carefully chlorine treated and tested several times each day. Our pool is heated naturally via heat exchanged from the artesian hot spring and covered at night in the winter to retain the heat. For your comfort and safety, an ADA compliant pool lift is available for use. Private and group swimming lessons are offered throughout the year and are regularly scheduled during the spring and summer. All classes are taught by Red Cross Certified Lifeguards. Open to the public seven days a week, Avila Hot Springs is a fun family destination and a great spot for groups and parties to gather, perfectly situated in a southerly facing location just 2 miles from the beaches, in a valley between oak-covered foothills offering protection from the morning fog in the summer and dazzling views from the pool decks all year long. All payments are to be paid in person, no later than one week prior to the 1st day of the Session. REGISTER AT: AVILA HOT SPRINGS CALL 805-595-2359 FOR MORE INFORMATION.